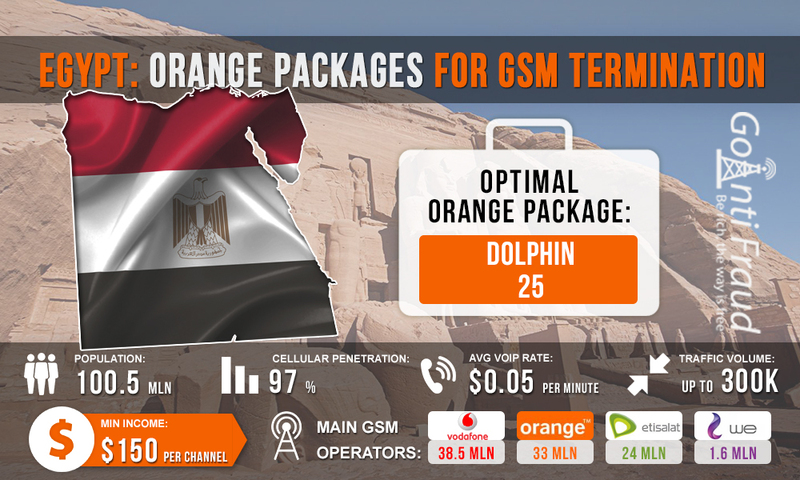 Orange used to be the largest mobile operator in Egypt (then known as Mobinil). Now Vodafone is the market leader in the country, but Orange remains its main competitor (it owns more than 33% of connections). Orange offers good GSM coverage. SIM cards of this operator will be a good solution for making money on termination. Prepaid SIM-cards from Orange can be bought both in brand stores and from street dealers. The cost of one start package is about $1. Several ranges are available for the prepaid clients, which may be suitable for termination - Eagle, Dolphin and Fox. Eagle Mini. It provides 1500 minutes for calls within the Orange network and 200 minutes for calls to other networks. Cost - $4. Eagle 100. Unlimited within the Orange network and 500 minutes for calls to other networks. Cost - $5.7. Eagle 300. Unlimited calls to all networks + the bonus of $51 a year for the services. Cost - $17. Eagle 500. Unlimited calls to all networks + the bonus of $91 a year for the services. Cost - $28. Eagle 1000. Unlimited calls to all networks + the bonus of $344 a year for the services. Cost - $58. Dolphin 25. It provides for 1000 units (both, minutes, SMS's or megabytes of mobile Internet traffic can be used). Connection fee — $1.4. Dolphin 40. It provides for 1800 units (both minutes, SMS's or megabytes of mobile Internet traffic can be used). Connection fee — $2.3. Dolphin 60. It provides for 3000 units (both minutes, SMS's or megabytes of mobile Internet traffic can be used). Connection fee — $3.4. Fox Daily. 30 minutes for calls for one day. The price is 6 cents. Fox Double. 90 units for two days. The price is 11 cents. Fox Weekly. 200 units and unlimited SMS for seven days. The price is 30 cents. Fox Monthly. 400 units and unlimited SMS for 30 days. The price is 86 cents. Units can be spent to make calls and to use the mobile Internet. Calls to other networks are rated at five bonus minutes from the package for each minute of conversation. That is, if there are 30 minutes in a package, it is enough for six minutes of a call to another network. Dolphin 25 package is best suited for gtech gsm gateway. Even if we use half of the provided minutes, so as not to raise the operator's suspicion, a minute of a call will cost us only $ 0.002. Thus, your income will be at least $300 from one gateway port.